Henry Sief of the health office has released the latest figures on infectious diseases in Los Angeles and the news is wonderful. There were only 20 cases of diphtheria in August, a 31% decrease from the 29 cases in July. Scarlet fever was down to 9 cases in August, a 55% drop from July, when there were 20. Tuberculosis is down to 10 cases from 24. Best of all, there were no measles or smallpox cases, Sief says, while there was one smallpox case in July. Typhoid, however, is on the rise, with 15 new cases in August, compared with 12 cases in July. Mathematical problems, alas, prevent us from knowing the exact mortality figures for August 1907. The Times reports that deaths included 61 Los Angeles natives, 163 people from Pacific Coast states and 251 from elsewhere in the U.S., then gives the total of 328 as opposed to 475. 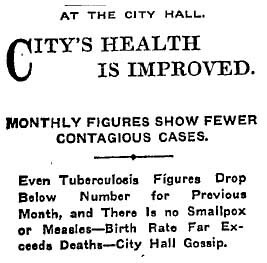 Sixty-one people, or 12.8 percent, died of tuberculosis, The Times says.